Miu continues to shun the AEGIS Network because she hates the idea of hurting people, but Satoka, a Gate Keeper Kageyama recruited from Kobe seems to be the opposite - she hunts them for pleasure! Unfortunately, the Invaders don't allow the Gate Keepers the luxury of time for debate: Ayane is ambushed and goes into coma, Count Akuma returns, stronger than ever, and Ghost Girl can't wait to turn everyone into invaders. But why does Ghost Girl have a soft spot for Ayane? 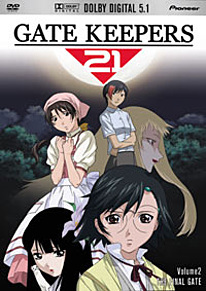 DVD Features: Clean opening animation, a reversible cover, and Previews.